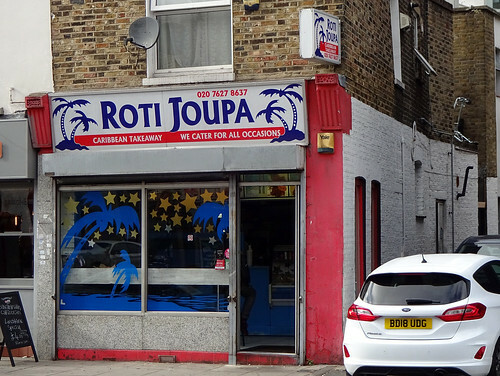 This week's featured article is for Roti Joupa, a Trinidadian takeaway near Clapham North tube. I don't tend to venture to Clapham much (unless I've got on the wrong Overground train at Canada Water without realising), but I might make an exception for somewhere that sells macaroni pie. I enjoy macaroni, I enjoy pie, I also enjoy tamarind sauce - perhaps one day I will even enjoy Clapham? Regular readers will recall last week's spoiler alert concerning a jaunt to Bromley ('the place where broom grows'), resulting in new pages for Sanxia, a Sichuan/Hubei Chinese restaurant, and the Star and Garter pub. There's also updates for the Red Lion, the Barrel & Horn, and Indian restaurant/hotel Tamasha, which has mucky pictures in the loos "ancient Indian artwork of an adult nature". One can only hope it's up to the standard of the infamous decor of Cafe Bangla (aka the Princess Di place) on Brick Lane. How might one get to Bromley, I hear you ask? The direct path is unlikely to involve Cannon Street, but if you find yourself in said station you could visit the Sir John Hawkshaw Wetherspoons or nearby Japanese restaurant Koya. But where *can* you get to from Cannon Street? Douze points to whoever said Sidcup ('a flat topped hill'), where there are three pub updates, for the Hackney Carriage microbrewery, the Alma and the Hill Top Tap. 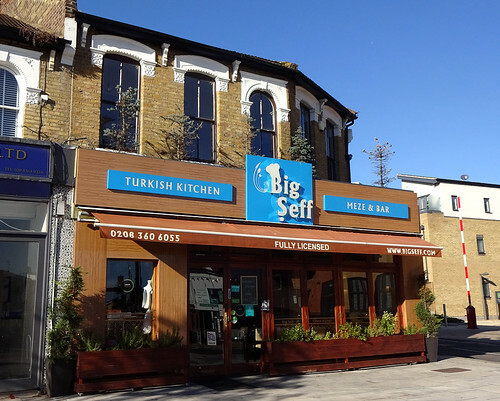 Right at the top of Green Lanes in Winchmore Hill, there's a new page for the Little Green Dragon pub, and an update for Turkish restaurant Big Seff. There's also a new page for the Temple Brew House bar and microbrewery, just off the Strand. Finally we come back to Trigger's Bromley, where the Cineworld is temporarily closed, while it transforms chrysalis-style into a Picturehouse. Hullo all, I hope you had a good break! This week's featured article is for Mazi, CR0 2RF, a small Turkish restaurant in Croydon. The kebabs and stews definitely come recommended - the yoghurtlu lamb shish sounds delicious. New to RGL is Chennai Dosa, a laid back South Indian restaurant in Tooting serving dosas and uttappam (aka Indian pizzas). The spice level is variable but the pricing is very reasonable. A number of pub closures to report: the Star in St John's Wood, the Green Dragon in Winchmore Hill, and the Carlton Tavern in Kilburn - which was demolished without any warning given at all. Outrageous! Less drastically, the Adams Cafe in Croydon is now a pizza restaurant, the Clarence on Balham High Road is now called the Balham Arms, the Charles Dickens in Borough is closed while it's having a spruce-up, and the Kennington Bookshop is set to close at the end of May.